Dr. Mkumbo (right) who became the fourth Bishop of ELCT Central Diocese. The newly consecrated bishop in the Evangelical Lutheran Church in Tanzania (ELCT Central Diocese) Dr. Alex Mkumbo paid a courtesy call on Mr. Brighton Killewa, the Secretary General of ELCT and urged members of staff at the ELCT Head Office to give him cooperation and keep him in prayers. Bishop Dr. Mkumbo who was at the ELCT Head Office on January 9th accompanying a delegation from the Lutheran Church in Northern Germany, said there is a hard task ahead of him but through obedience and trust in God and prayers from each and every member; things can be done. 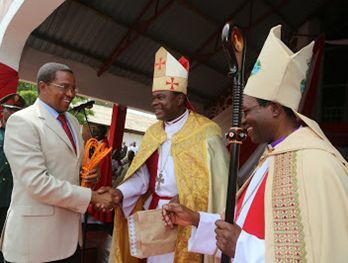 Bishop Dr. Mkumbo was consecrated to become Bishop of ELCT Central Diocese on January 6 this year at a well attended service held at Immanuel Lutheran Cathedral in Singida. President Jakaya Kikwete was guest of honour who assured of the Government support to religious organizations in serving the community. He said he was wary of frequent conflicts related to religious differences. He urged religious leaders to meet regularly to sort out their differences instead of engaging in outright conflicts as it was the case in 2012. The ELCT Presiding Bishop Dr. Alex Gehaz Malasusa thanked the President for his assurance of religious freedom as provided by the Constitution. He pledged to join hands with other religious organs to ensure observation of law and order in order to maintain peace in the country. 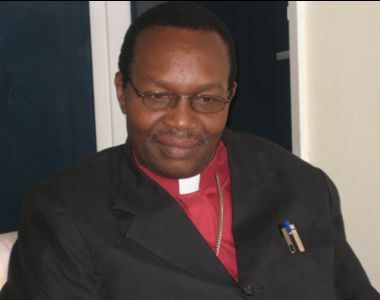 Bishop Dr. Mkumbo brings with him a whale of experience having been the director of the Lutheran Theological College Kiomboi in Singida between July 2008 and December 2012. He is a holder of PhD in Theology (2008) from the Tumaini University Makumira; lecturer of Systematic Theology at the Kiomboi and is involved in the establishment of the proposed Singida University College. The ELCT Secretary General, Mr. Brighton Killewa (Left), with Bishop Dr. Hans-Abromeit from the Lutheran Church in Northern Germany (right) when he paid him a courtesy call at his office on January 9 this year. He was accompanied by his host Bishop Dr. Alex Mkumbo (center) and Rev. Matthias Tuve who is responsible for the global desk on ecumenical affairs. The Northern German Church has a companion relations with Central Diocese and that Bishop Abromeit and Rev. Tuve represented their church at the consecration service in Singida. The ELCT Presiding Bishop, Dr. Alex Malasusa; Bishops from ELCT Dioceses; ELCT Secretary General, Mr. Brighton Killewa, ELCT Deputy Secretary General for Mission and Evangelism, Rev. Ambele Mwaipopo; were among hundreds of people who were present during the consecration of Bishop Mkumbo. In his acceptance speech Dr. Mkumbo pledged to collaborate with others in solving problems and meet challenges affecting his diocese by relying on the guidance laid down by the church. He urged those in church leadership position to be trustworthy, work diligently and become good stewards in order to gain support and confidence of those they lead. The Evangelical Lutheran Church in South Africa was represented by Bishop William Bowles and Mrs Ida Naidoo from the Cape Orange Diocese based in Kimberly.